A "Tower of Babel" device that gives the illusion of being bilingual is being developed by US scientists. The system, detailed in New Scientist, is not yet fully accurate, but experts said it showed the technology was "within reach". The translation systems that are currently in use work by using voice recognition software. But this requires people to speak out loud and then wait for the translation to be read out, making conversations difficult. But the new device, being created by researchers at Carnegie Mellon University, Pittsburgh, is different. Electrodes are attached to the neck and face to detect the movements that occur as the person silently mouths words and phrases. Using this data, a computer can work out the sounds being formed and then build these sounds up into words. The system is then able to translate the words into another language which is read out by a synthetic voice. The team currently has two prototypes: one that can translate Chinese into English and another that can translate English into Spanish or German. If the prototypes used a small vocabulary of about 100-200 words they worked with about 80% accuracy, researcher Tanja Schultz said. But, she added, a full vocabulary had a much lower level of accuracy. Professor Schultz said: "The idea is that you can mouth words in English and they will come out in Chinese or another language." 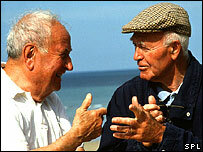 The ultimate goal, the researchers said, was to be in a position where you can just have a conversation. Chuck Jorgensen, a researcher at Nasa's Ames Research Center in Moffett Field, California, told New Scientist: "This is showing the technology is really within reach." Phil Woodland, professor of information engineering at the University of Cambridge, said: "This work sounds interesting. Most groups are working on translating audio data into different languages, but this is different to work I have come across before because they are not working from a real acoustic signal."